Scene in PlayClaw is a set of overlays with customized settings. You can prepare a set of scenes and quickly switch them at any time. Even while you're playing game. 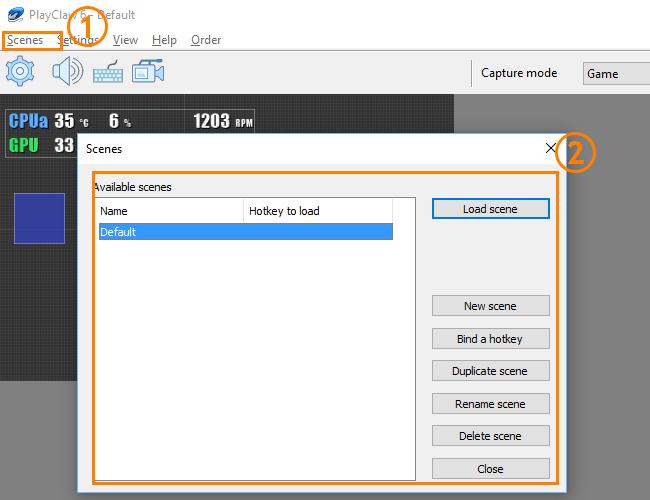 Click to Scenes menu to open Scenes manager. Here you can load any scene, create a new scene, duplicate, delete or rename existing scene. You can bind a hotkey to a scene for fast scene loading without opening Scenes manager. 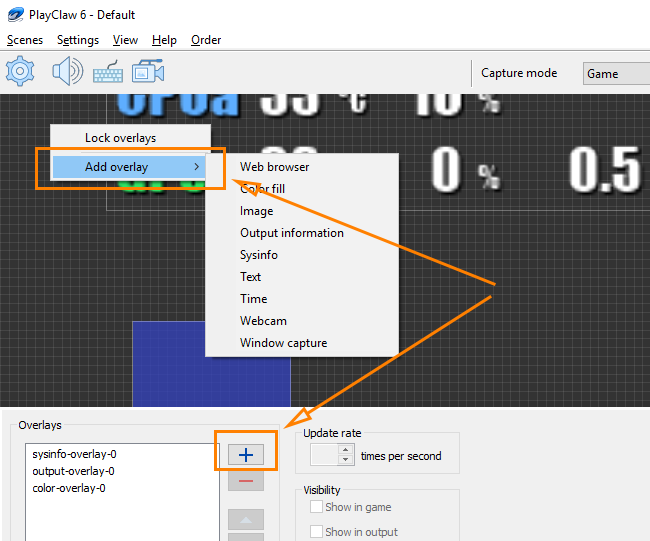 Overlays in PlayClaw is a core feature, which distinguishes PlayClaw from the most of similar tools. Overlays can be rendered not only to the output like in some popular streaming software, but also over your game screen! If you have only one display, then PlayClaw overlays are the only way to see Twitch and YouTube chats, System information, Teamspeak voice overlay, various timers and other useful information. Overlays can be added in a scene in two ways: with clicking right mouse button on the preview screen or with clicking to "plus" button on dashboard. Context menu has almost the same options like Dashboard. With their help you can add, delete overlays, change their rendering order, set overlays visibility options (on game screen or/and on output).